Celebrating birthday is always a nice ocassion to get together with your family again. 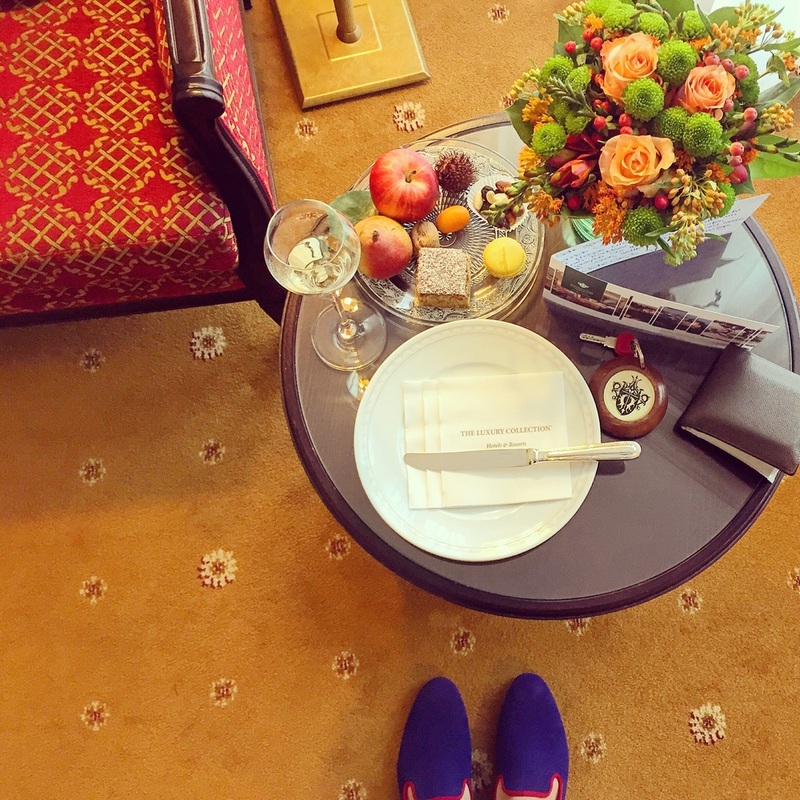 As luxury travel bloggers, why not spend your day of the year in a nice hotel? The Schloss Fuschl seemed to be the best place for this kind of trip and it was definitely time to stay there again - I've been there regularily using the SPG Free Night Awards until 2011 when they stopped the promotion. The best way to prepare for a test stay is always by checking reviews on tripadvisor, so that we know exactely where to take special attention on. This time however it was YHBU, one of our favorite blogs, which was giving us a clear guideline on how to investigate Schloss Fuschl Resort. From the moment I drove through the gate, I was blessed by the beauty of the complex, the castle and the location on magnificent Lake Fuschl. Having arrived from Munich and thanks to my colleague Lukas, my car was fully packed and I was very happy to see the bellman waiting for me to help me transferring all bags into my room. Check-in was smooth, a glass of sparkling wine arrived - I even could enjoy it and take it with me (not like at Thurner's Alpenhof where I had been rushed to drink the glass of rose). Altough I was informed that I had been upgraded, the room looked quite usual (it was no Junior Suite or something special). Anyhow it was a wonderfully designed double room overlooking the more peaceful part of the lake. A nice touch was the minibar which is complimentary and includes two big bottles of each sparkling and still water, Red Bull coke, regular coke and coke zero, apple and orange juice as well as beer. Beside the handwritten welcome letter, it was nice to see a plate with snacks and sweets. On the next day, my birthday, I was surprised with a bottle of the hotel's own sparkling wine and a small edition of the delicious Schloss Fuschl cake in addition to again a wonderful handwritten letter by the Assistant of the General Manager, which by the way also welcomed me and all other family members upon arrival. The bathroom was not the most spacious one, although a pleasure to see a separate walk-in shower (love that), tub with window to the bedroom offering lake views and a separate toilet. Unfortunately the actual toiletries are even worse than the last ones (in 2011 they had Water L'Eau now it's Pure Herbs), so I had to unpack my emergency kit by Zenology. After a heavenly night without any noise, I was ready to discover breakfast. Being welcomed by the vast and gorgeous views of Lake Fuschl, the day was already perfect. Glasses of sparkling wine for everybody already arrived, before I could even take a glimpse of the buffet. From excellent salmon, fresh bread, the tasty Schloss Fuschl cake, to freshly prepared egg dishes from the a la carte menu to a small corner for kids - there was absolutely nothing I missed during breakfast. It seemed that we were some of the only guests in the breakfast room, so we enjoyed of course a kind of special treatment ;-)! Altough the complete service staff was so helpful (bringing plates from your breakfast choice to the table) and friendly, I have to admit that I was impressed from the wonderful views and my excellent scrambled eggs with Austrian vulcano ham. What's better than pampering yourself in a top spa? Well, there is nothing else I enjoy more than chilling at the poolside and regularily visit the hot outdoor jacuzzi. The only problem I had on that day was that I had to decide between my ItalYachtClub and Bluemint bath short, so you see... relaxing at Schloss Fuschl is definitely more easy than anywhere else. The day would have been even better if they would have had a selection of magazines (the only magazine was the Austrian female magazine "woman"), such as the Condé Nast Traveller or others. From my point of view, the complete spa looked well maintained, the pool had a good temperature (not warm but accurate), the jacuzzi was wonderful being situated outdoors and being heated, the two saunas and one steam bath were empty nearly all the time, so nothing to complain about. If you're in for a gourmet evening, book a table at Döllerer's Genießerrestaurant - one of the best restaurants I know and just a half-an-hour's ride from Schloss Fuschl. Otherwise there is the Restaurant Esszimmer in Salzburg centre. If you want to stay in the resort, there is also the possibility to dine in the wonderful Schlossrestaurant or have dinner at the Jagdhof (they have amazing "Salzburger Nockerln"). The Schloss Fuschl is definitely worth a visit during winter and spring, since the hotel is not full of people and you can gather the feeling of having your own castle in the Austrian mountains. Again, without a break since my last stay a few years ago, it is still a favorite hotel of mine for a relaxing and luxurious getaway. Thanks to the entire team for making my birthday extra special, I felt truly welcome. Mr Travel Executive was invited by Schloss Fuschl Resort & Spa during his birthday. However all above written expresses our own opinion and has not been influenced in any way.